Why does the enamel crack when cool? If the enamel chips off and exposes another layer of enamel, it is almost certain that the enamel was applied too thickly. Therefore you need to reduce the thickness of enamel in future. You can re-fire the chipped piece without adding more enamel, as the exposed layer will be of the correct thickness. Alternatively, if you counter enamel (enamel on the reverse side) there is no limit to the thickness of enamel that can be applied to the face side! 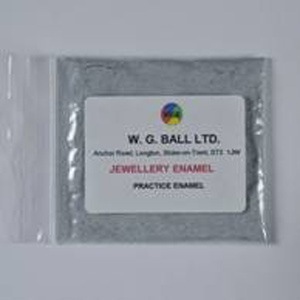 You can use any enamel to counter enamel including basic practice enamel.